Whales, Whaling, and Ocean Ecosystems, a new book from the University of California Press (December 2006), explores an aspect of whale ecology that until now has received surprisingly little attention. Focusing on the role of whales in ocean ecosystems, the book looks at the effects of industrial whaling in terms of its ecological impact on the world's oceans. "We've thought a lot about the impact of whaling on whale populations, but not about its impact on ocean ecosystems and the functional role of whales in the oceans," said James Estes, an adjunct professor of ecology and evolutionary biology at UC Santa Cruz, who edited the book along with several colleagues. Approaching these issues from a broad range of perspectives, the book provides a sweeping overview of the natural history, biology, and ecology of whales in the context of their influence on ocean ecosystems and the ecological consequences of a whaling industry that removed large numbers of whales from the oceans. 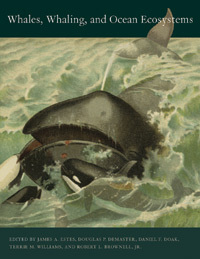 The book resulted from a workshop on whaling and whale ecology organized by Estes and his coeditors and held in Santa Cruz in 2003. Joining Estes in organizing the workshop and editing the book were Daniel Doak and Terrie Williams, both professors of ecology and evolutionary biology at UCSC; Douglas DeMaster, director of the Alaska Fisheries Science Center; and Robert Brownell, senior scientist with the Southwest Fisheries Science Center. The workshop was supported by funds Estes received as a Pew Marine Conservation Fellow. Whales are the largest animals on the planet, and they are such impressive creatures that our interest in them has tended to focus on the whales themselves rather than on the roles they play in the marine environment, Estes said. But their large body sizes and high metabolic rates make them important players in ocean food webs, and they are found throughout the world's oceans. "The whales were and are important just because they are so big and so abundant," Estes said. "How different are the oceans when you remove these animals? That's what we wanted to explore." This question has important implications for the conservation and management of the great whales. Management strategies must be considered not only in terms of their effects on the sustainability of whale populations, but also in terms of how they will affect the broader ocean ecosystems in which whales are key players. In the book's introduction, Estes describes how he stumbled onto this issue in the first place through his investigations into the collapse of the sea otter population in southwest Alaska. He and his colleagues came to suspect that killer whale predation was causing the sea otter decline. They eventually proposed that whaling prompted a dietary shift in killer whales that had previously preyed on large whales. As the great whales became scarce, the killer whales turned to smaller marine mammals, including seals, sea lions, and sea otters, all of which underwent marked population declines (see earlier press release). This remains a highly controversial hypothesis, and various aspects of it are examined in several chapters of the new book. Contributors to the volume include ecologists, population biologists, physiologists, geneticists, oceanographers, economists, and experts in environmental policy and law. In addition to the editors, several UCSC scientists contributed to various chapters, including biologists Donald Croll, Bernie Tershy, and Daniel Costa, oceanographer Raphael Kudela, and biostatistician Marc Mangel. Estes said many of the questions raised at the workshop remain unresolved. But the book provides a wealth of information for anyone interested in these issues. "Our hope is that this book will stimulate more research on the role of whales in ocean ecosystems," Estes said.